Odyssey is as hot as any company in golf right now on tour, with more players putting the brand in play than any other. Recently, the company released an extension to the O-Works lineup and the Marxman S was a model that many THPers were interested in. Previously, we sat down with Sean Toulon from Odyssey to discuss O-Works, putters in general and how deciding on a new flat stick starts with the looks. Want to try this putter out for yourself? Today is your lucky day, all you have to do is follow these three quick and easy steps to enter. 1. Watch the really interesting video above. 2. Post in the comments below what you thought about Sean’s breakdown and how this putter might benefit you. 3. Sit back and see if you won. That is it. Later this week, we will announce the winner on the THP Forum and you could have it in hand before you know it. If you don’t win, but still want a chance to pick golf equipment up at discounted prices, THP has a Budget Golf coupon on the right side of this page and you will find everything you need here. Erik Anders Lang – The Most Interesting Man in Golf? I spent way too much time on Saturday at PGASS and GG rolling putters since it was snowing (don’t get me started…lol). The one that definitely stood out for me was the 2M CS. The microhinge face insert felt absolutely great. Great feel and distance control. The most important thing in putting is distance control, and this definitely had it. It rivaled my Edel putter which was more than twice the cost of it! Great putter and ended up convincing my buddy who struggles with putting to get one. Sean’s explanation of how they chose the correct Red color was interesting. 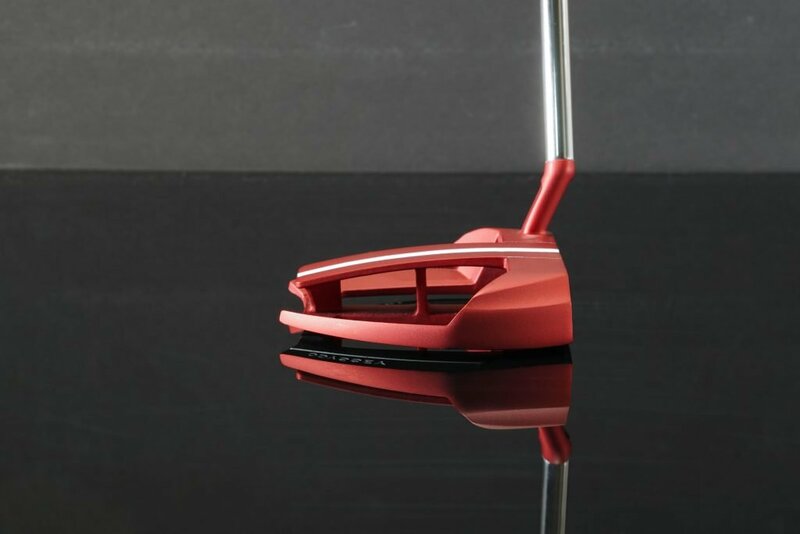 I would love to try this putter because it is Red and has the micro hinge technology. I really like the slant neck. The tech behind the microhinge insert should help get the ball rolling quicker. Lastly, I won’t buy a putter unless it has an aiming line. This one checks that box! For someone who has flitted like a butterfly from putter to putter in search for that perfect putter, the combination of the colour the alignment aids and the control that the micro hinge face would give, would probably make this THE Putter! My search might just have ended! Really! No, No!! I mean it! Really thought the design (slant edge) would help me keep the putter neck closer to my body, and of course the color red is a sharp look. I really like the micro range face with the micro hinge technology because I think of that forward roll of the ball really helps. Micro range face and color. Great little breakdown, currently in the process of trying to find a new putter. Have tried numerous brands/models and really like how the micro hinge face insert performs and curious as to how it would improve my putting. I think the hing theory is cool and i like the way he speaks about the lift on the ball to reduce backspin. As a total golf geek I have been trying almost everything to fix my inconsistent putting. To be honest, buying one of the best putters in golf has never been an option for me, but that’s not true any more. After seeing these newer Odyssey putters online, and watching the video of Dean and Sean, I am now considering just that. Sean’s description of the micro-hinge face was enlightening to say the least. To be able to reduce, or even stop the jump and backspin I often see, would be a huge game changer for me. The red color is such a great choice to improve not just the looks, but the visibility during line-up and stroke. Thank you Odyssey, for great looking putters and the dedication to leading edge technology.